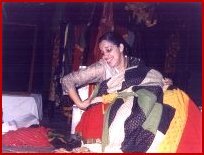 NEELAM MAN SINGH CHOWDHRY, Artistic Director of The Company, graduated from The National School of Drama. Her work has been presented at major festivals around the world, including LIFT, Festival d’Avignon and Festival of Perth. She teaches drama at the Punjab University and also contributes articles on theatre. Established in 1983 in Chandigarh, Punjab, The Company has earned renown for creating a theatre that fuses source material from Western classics with a performance style grounded in an earthy Punjabi aesthetic. It is also renowned for counting among its performers a group of traditional Naqqals (female impersonators) who have had a long tradition as performers. “An Unposted Love Letter” is a monologue taken from one of Doris Lessing’s collection of short stories. The story is set in the green room of a theatre, where an actress reminiscences about her life and in this process comments on how a conventional society perceives an artist. The story has no beginning, middle or end and is strung together in a complex tapestry of ideas, attitudes and value.